Although any backup is better than no backup at all, Time Machine may not protect your data to the extent or in the way that you need. A few significant weaknesses offset its impressive strengths. Time Machine copies the files on your computer to a destination you designate—an external hard drive, a second drive inside your Mac, an extra partition on your internal hard disk, a network server, or Apple’s new Time Capsule device. Then, once an hour, the program runs again, updating your backup to include whatever files have changed since last time. Effortlessly Produces Many Backups With each hourly backup, Time Machine takes what amounts to a snapshot of your entire system at that moment. If you look through the folders on your backup disk, you’ll see what looks like a complete copy of all your files for each of numerous backup sessions. But to some extent that’s an illusion; Time Machine copies to your backup disk only those files and folders that are different from the ones in your previous backup. Using a bit of Unix magic known as hard links, Time Machine can store just one copy of a file or folder but make it appear to be in several places at once. That way, your disk doesn’t fill up with multiple copies of files that haven’t changed. Travel through Time: Click on the up and down arrows or use the timeline on the right to zoom back in time to an earlier version of a folder. Time Machine keeps all of the day’s backups for 24 hours, but then it begins to delete older versions to save space. You can count on it to keep the first backup of any given day for an entire month. Even after a month, it preserves the first backup of each week until your disk is nearly full. Only at that point does the program begin purging files from your oldest weekly backups. The net result is that you see your files as they appeared at many points in the past, though not all points in the past. Quickly Restores Files To retrieve a file or folder from your backups, click on the Time Machine icon in the Dock. Click on the up and down arrows or use the timeline to the right to zoom in on earlier views of a particular folder or file until you find the version you want (see “Travel through Time”). Click on the Restore button and your file comes back to the present. Restores an Entire Disk Although the procedure is somewhat time-consuming, Time Machine can also return your entire disk (including OS X itself) to its state at some point in the past. Uses a Network Volume, If You Choose You can use Time Machine to back up multiple Macs in your home or office to the same disk, as long as they’re all running Leopard. Runs Automatically or Manually If you aren’t content with Time Machine’s hourly schedule, you can turn it off and run backups manually at any time. Doesn’t Make Bootable Duplicates Even though Time Machine backs up every file on your disk to another hard drive, you can’t start up your computer from your Time Machine backup. That means if your internal hard drive is damaged or corrupted, you’ll have to spend hours restoring your data before you can get back to work. Doesn’t Give You Much Control You can tell Time Machine to ignore particular files or folders by adding them to its Do Not Back Up list. But you can’t exclude files based on certain criteria (for example, all movie files over 2GB in size or all files with the extension .dmg). In addition, you can back up your files to only one destination at a time, and you can’t opt to back up some files to one disk and others to a different one. Time Machine’s hourly, daily, and weekly backup schedule is likewise fixed. You can turn backups on or off (see “Simple Controls”). You can’t, however, adjust the schedule without using a command-line hack or third-party software, such as Stefan Klieme’s free TimeMachineScheduler). Doesn’t Use Optical Discs Time Machine can store its data only on a hard disk, not on CDs or DVDs. Simple Controls: The Time Machine preference pane has just a handful of controls, including a cartoonishly large on/off slider. Doesn’t Use AirPort Disks If you have a hard drive attached to your AirPort Extreme Base Station—or for that matter, any network-attached storage (NAS) device except the Time Capsule—Time Machine won’t recognize it. Doesn’t Compress Files Time Machine requires a significant amount of disk space, and although it doesn’t store duplicate copies of identical files, it doesn’t compress your files either. If you have tons of data and only a modest amount of storage space, Time Machine may not be for you. Doesn’t Use Encryption Anyone with physical access to your Time Machine backup disk will be able to read all your files. If you can’t guarantee the security of that disk and you work with confidential files, you should think twice before using Time Machine. Files that were already encrypted, such as FileVault disk images, do remain so in your backup—which brings us to our next point. Doesn’t Include Off-Site Protection In addition to those specific problems, Time Machine may provide you with a false sense of security. After all, someone who breaks into your office and steals your Mac will probably pick up the hard drive sitting next to it, too. Likewise, disasters like fires and floods won’t spare your backup drive. If you’re really serious about protecting important data, it’s best to include some sort of off-site backup—for example, using an online backup service or storing a bootable duplicate at your sister’s house—in your plan. Given Time Machine’s talents and drawbacks, most Leopard users fall into one of three categories: those people for whom Time Machine can serve as a sole backup, those who should use Time Machine along with other backup methods, and those who should avoid Time Machine altogether. Here’s how to figure out what you need. Use Time Machine Only If you haven’t been backing up your data at all, clearly Time Machine is a lot better than your previous plan. However, I recommend using Time Machine alone in only a few circumstances: if you have more than one external hard drive on which Time Machine can store its backups and you can keep one of them safely offsite at all times; if you don’t mind the thought of spending several hours restoring a backup in the event of serious problems; or if you have two or more Macs running Leopard, so you can quickly switch to another computer in the event that your main hard drive fails. Use Time Machine and Then Some In many cases, Time Machine will do the trick if you add just one element. For instance, if you also want a bootable duplicate of your hard disk, you can use any of numerous programs to create one separately. (For instructions, see Easy Mac Backups.) You must store the duplicate on its own drive or partition in order for it to be bootable. If your external drive is large enough, you can use Disk Utility (in /Applications/Utilities) to create an extra partition just for the bootable duplicate. If you use FileVault and want to be able to restore individual files from your user’s folder more easily, you can use Prosoft Engineering’s $99 Data Backup 3, Memeo’s $30 LifeAgent ( ), Code 42’s CrashPlan Pro ($60 plus monthly online backup costs), or other software that provides file-by-file encryption to back up those files safely while you’re logged in. Skip Time Machine Avoid Time Machine altogether if you don’t have, and can’t obtain, a sufficiently large hard drive (see “Think Big”). Likewise, pass on it if you want to back up to optical media (recordable CDs or DVDs). If security concerns require that your backups be encrypted, Time Machine is not for you. What If You Already Have a System? Even if you fall into one of the categories of people who’d benefit from using Time Machine, there’s another question to consider. What if you already, prior to installing Leopard, had a perfectly good backup system in place? Should you ditch it and use Time Machine instead? Keep the existing system and add Time Machine? Or combine the best elements of each? Without a doubt, adding Time Machine to your backup strategy makes sense if you’ve only been making bootable duplicates of your drive. As useful as those are, by themselves they provide no way to recover multiple older versions of any given file, or files deleted before you made your most recent backup. However, in some circumstances, the path of least resistance may be to stick with your existing backup scheme. For instance, that’s probably the case if you use a client-server backup system, such as EMC Insignia’ s $129 Retrospect Desktop 6.1 ( ), to store your backups on a network server that’s unsuitable for Time Machine. Likewise, if you back up one or more computers to an AirPort Disk or other NAS device, Time Machine’s incompatibility with these may prove to be a killer, unless you’re willing to invest in a Time Capsule. Check Your Drive: To see how much hard-drive space you’re using, select your drive in the Finder and look at the Used figure in the Get Info window. It might also be easiest to stick with your current system if your job requires you to preserve copies of every backup you make, disk space notwithstanding, or if the cost of obtaining the additional disk space needed for Time Machine is prohibitive. 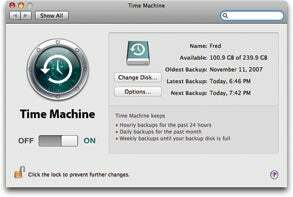 Time Machine normally stores your backups on an external hard drive, or on a second internal drive on a Mac that has more than one. (Although you can also use an extra partition on your main drive, it’s not a good idea—lose that drive and you lose all your backups.) So if you have a spare drive (or a drive with enough free space), you may be able to use it with Time Machine. But how much free space is enough? Begin by finding out how much space your data currently occupies on your startup disk. To do this, select the disk in the sidebar of a Finder window and choose File: Get Info. In the window that appears, look in the General section next to the word Used to find out how much space your data is using. Now, multiply that number by 1.2; the result is the minimum amount of disk space Time Machine can work with. (That’s because Time Machine needs space for all your files plus some extra room to enable it to store new data and multiple copies of files that change.) 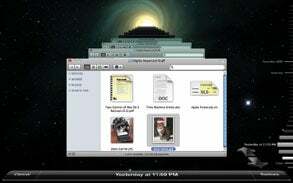 However, more space is always better, because it enables Time Machine to retain backups that go further into the past. I suggest having a backup disk with at least 1.5 times as much free space as the amount occupied on your startup volume, and more if possible. Time Machine works best when it has an entire disk, or at least a partition on a disk, all to itself. So if you have a suitably large drive that’s completely blank or that you can erase, that’s ideal. 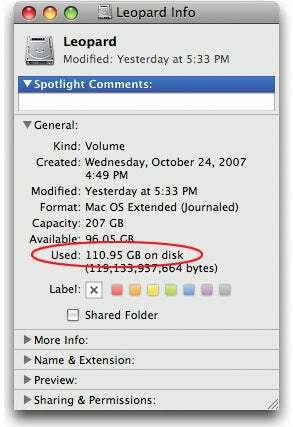 You can use Disk Utility (/Applications/Utilities) to erase a disk, or to divide an existing disk into multiple partitions—one of which you’ll devote to Time Machine.